We jump at any chance to hear major opera stars up close and personal in a recital format. Sometimes they fall a bit short without the drama, the scenery and the costumes. 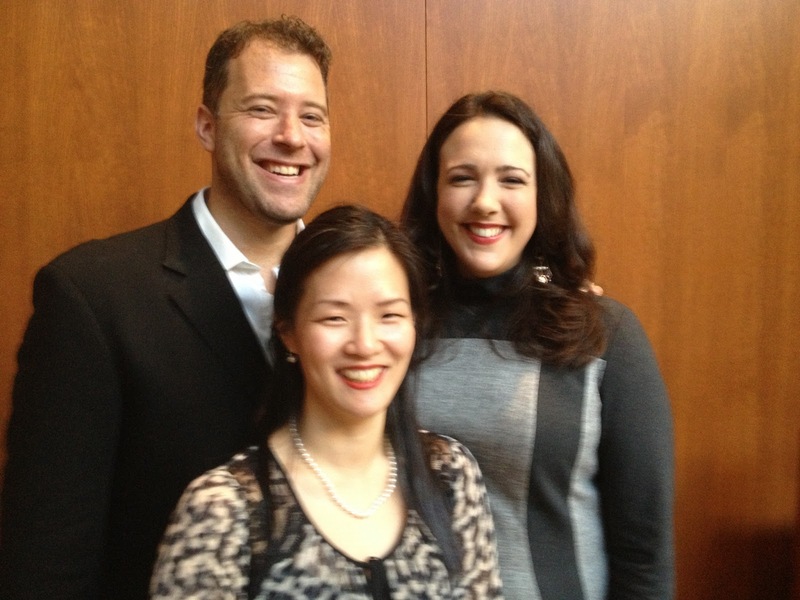 No such disappointment existed at the Morgan Library Sunday afternoon when Metropolitan Opera stars Susanna Phillips and Joseph Kaiser shared the recital stage with collaborative pianist Myra Huang and violinist Michelle Ross. This was the last recital of the season presented by the George London Foundation for Singers. We reviewed Ms. Phillips solo recital at Carnegie Hall last February which completely blew us away (see "From Snow to Glow") but had never heard Mr. Kaiser in recital. This afternoon's program was entirely in French. We delighted in hearing some familiar favorites, especially Ms. Phillips' performance of Mozart's "Dans un bois solitaire et sombre" and Martini's "Plaisir d'amour". But it was her performance of "Certain coucou" by André Grétry that completely charmed us. Those who love Mahler will recognize the tale of the voice competition in which the nightingale is overlooked by the donkey judge in favor of the owl and the cuckoo. We couldn't help opining about the current taste in music which makes us think that many audiences are composed of...donkeys! Tenor Joseph Kaiser was a pleasure to hear as well, particularly in Henri Duparc's "Phydilé" in which he showed exquisite dynamic control which was matched by the super-sensitive collaborative pianist Myra Huang who always seems to breathe along with the singer. Mr. Kaiser also introduced us to a song that was new to us but will surely become one of our favorites--"Si vous croyez que je vais dire" from André Messager's Fortunio. We are known to be suckers for melody and what a gorgeous melody did we hear. Still, it was two opera singers we were enjoying and must say that our favorite part of the afternoon was towards the end when we heard two selections from Gounod's Roméo et Juliette. Ms. Phillips' thrillingly bright soprano made "Je veux vivre" totally scintillating. What followed was a duet with Mr. Kaiser, the scene in which the enamored couple must part since Romeo has been exiled. It was incredibly moving and no sets or costumes were needed for us to believe the tragedy of premature separation. Included in the program was the Meditation from Massenet's Thaïs which gave us the opportunity to hear Ms. Huang accompanying violinist Michelle Ross. It was outstanding--sweetly seductive and passionate. Dear Meche, I am so delighted to read your review of this marvelous recital. I was fortunate enough to be in the room with you last Sunday for a truly memorable performance by these two upcoming opera stars.their incomparable accompanist, and the violinist, Michelle Ross. I was even more fortunate to have gotten some quality face time with Miss Phillips at the reception which followed. I had been smitten by Susanna Phillips when I heard her perform recently with Renee Fleming in Previn's "A Streetcar Named Desire" at Carnegie Hall. What a treat to hear her now in this more intimate setting. The works chosen by her and Mr. Kaiser were each and every one a veritable treasure, and stood on its own. The final wrenching duet, "Qu'as-tu donc", from Gounod's "Romeo et Juliette" was full of pathos and so well conveyed the torment of the young lovers' as they were forced to separate. Thank you so much for memorializing this memorable musical moment!